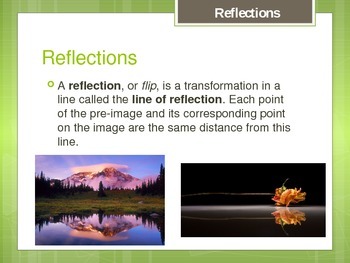 PowerPoint presentation about Transformations (rotations, translations, and reflections). Include examples of each topic that students can do during your presentation. **I have provided my customers a FREE download that pairs with this PPT called "Transformations_Charts+Graphs". 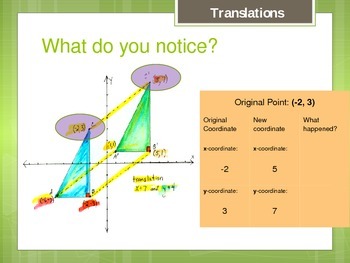 This is a half-sheet of paper that corresponds with each example presented in the PowerPoint. **Also provided for FREE is the "Transformations_Summary" sheet. This sheet sums up the entire PowerPoint and serves as a quick reference for students.